Last Saturday, saw Susanne and I off on another Textile Jaunt - this time to Norwich Cathedral. 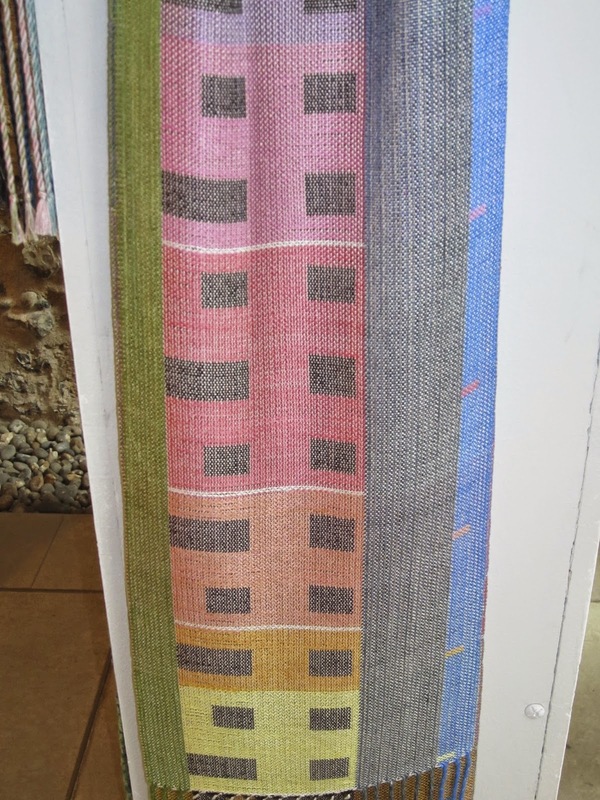 First we had a good look round the Biennial Exhibition of the Association of Guilds of Weavers, Dyers and Spinners, which was held in the Hostry and the Norwich School Crypt. 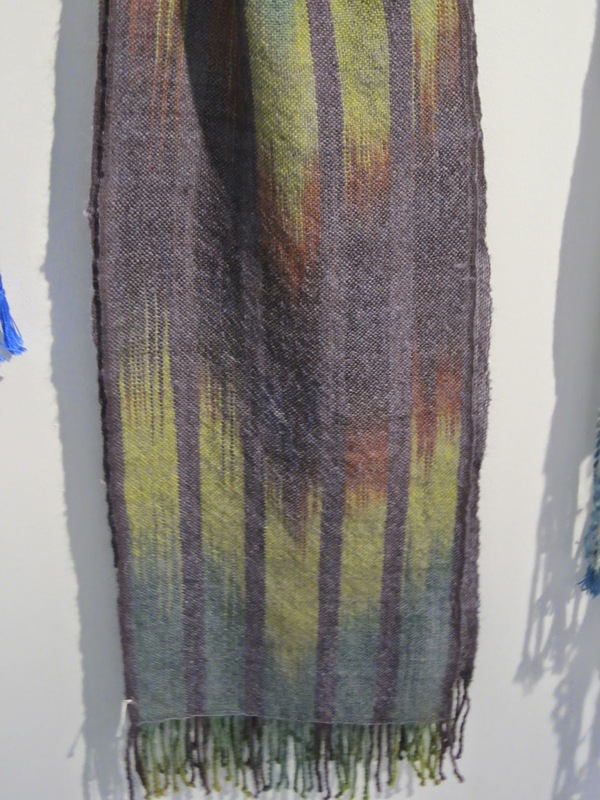 Some stunning work here, and we got to chat to one of the weavers demonstrating her work as well. Too many photographs to include them all here, but a few to whet your interest. After a pleasant lunch in the cafeteria we scuttled upstairs to the Weston Room for the Kaffe Fasset lecture "Glorious Colour". Kaffe himself did not disappoint, and we all, I think, wanted to take his partner Brandon Maby, home with us, he was such a lovely man; however their slide show left a lot to be desired - a combination of intruding sunlight, and the quality of their slides led to less than optimum viewing. Although if you were a long time fan of Kaffe's work you probably had all the books anyway and had seen the original quilts and source-works. He is certainly a good speaker and we were well entertained for over an hour. Sue and I were sat with a delightful lady - also called Sue, who, though born and bred in Norfolk, now resides in Thailand where she and her husband own and run a beautiful hotel. Sue returns frequently to see her mum and her daughter but loves her life out there. Here is a link to her website - www.thewaterfrontbophut.com Susanne and I have all but books our flights, it sounds so fabulous! Lovely to meet you, Sue and don't forget that airport pick-up!! We left the Cathedral in a blaze of sunshine and strolled off to check out Open Studios at The Jade Tree in Elm Hill, a very old and interesting part of Norwich. A friend of mine from nursing days until quite recently rented space here designing and making her glass jewellery, sadly I left it too late to come and see you in situ, Bev! We did however meet a lovely oil painter and photographer and chatted for some time in their delightfully cosy upstairs studios. On our way out we stopped to chat to Zoe Green www.weavingspace.com a weaver and basket maker, who showed Sue the ropes, as it were, of Saori weaving. I had expected that Zoe and I would have one or two friends in common, Aviva, and Nick for example, but had no idea that she would also know my musical, basket weaving friends Rob and Julie King - what a small world Norfolk is to be sure! We then walked to Pottergate, to find the new wool shop, Norfolk Yarn. We were made very welcome and had a lovely chat with the owner Becky - in fact I think I could have been hired on the spot to teach workshops had I been so inclined! I did feel the urge to purchase hundreds of skeins of yarn, but satisfied myself with just a couple. 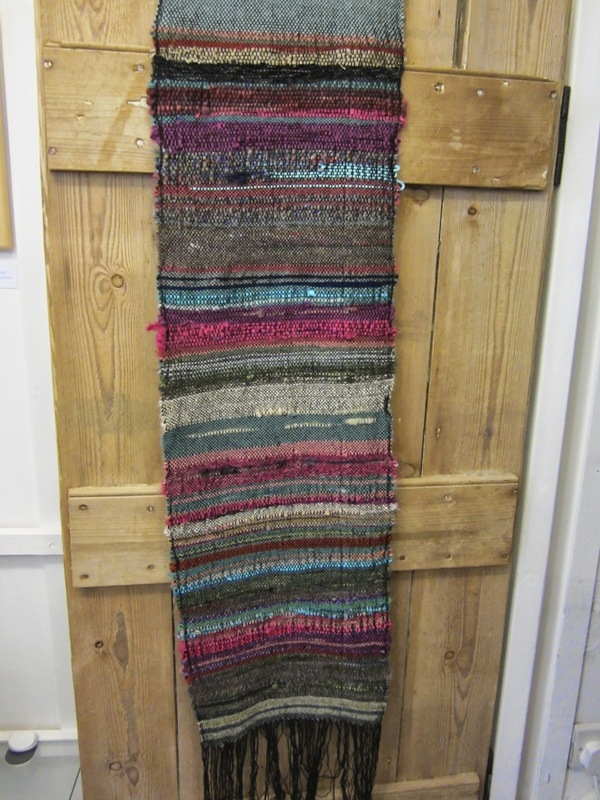 Took a few photographs and devoured visually the wonderful colour and textures of the glorious yarns in the shop. So a really lovely day, full of colour and chats and tea and laughs. After a dreadful drive to Susanne's in heavy rain, the sun then came out and the rest of the day was like mid-summer, it was gorgeous. Sunday I gave Yvonne the afternoon off at our Open Studios and settled down in her "studio" (living and dining room!) with my kindle and some stitching. I had a steady stream of visitors and sold some odds and ends, but had some super conversations. Especially lovely was a visit form Dc - her blog is Frugal in Norfolk. We have been reading and commenting on each other's blogs for some time now and it was great to actually meet up 'in the flesh' as it were! And later on a delightful visit from Gill of Dosie Rosie blog fame, and her friend Chris, we had a great chat and plan to meet up for coffee ...... lunch? in Holt when we can get our heads and diaries together. You know, blogging really does spawn some brilliant introductions, I've met some smashing bloggers in the last two years. You should try it! Sounds wonderful and just my cup of tea - wish I could have joined you! Would have been lovely to see you, Jane, and yes it was a great day out. Ooh! I remember Kaffe Fasset from my knitting days. Gorgeous colours in your photographs as always! Yes, t'internet's a wonderful thing, I reckon. I've met so many writers and other artists through their blogs and social networks, some of whom I've then met face-to-face. It shrinks the world. Thanks for a super day out. You seem to get to all the places I'd love to be and I do wish it wasn't so far away. Over the years, Since studying textiles in the 80s I've fallen in and out of love with Kaffe's work and products but I am loving his fabric range for Rowan. It is so lovely to hand stitch and, even the designs I least like, are stunning when cut up and P&Q'd. DD2 is buying me some for my birthday to make a quilt for myself. Oh my Lynne, you had some lovely days !!!! Those colours ! Great to see good old Kaffe and friend "living" his colours ! Must have been interesting to hear the master ! I really need a shop like that nearby... ;-)!!!! Made by Kaffe Fasset, Linda, Brandon is a designer and seems to smooth all of life's little rucks and tucks out of the way for Kaffe, but he is not The Main Man! Kaffe is th e designer of these quilts and garments but I think he has other people make them up for him. Love the 'visit' to the open studios in this post and the last one. Your work looks fabulous, and I hope you do really well. The little pockets of Norwich look very inviting.The wool shop has a lovely range, enough to get even me knitting away. Norwich is indeed a beautiful place isn't it? It's funny but I seem to appreciate it more when I see someone else's photos of streets I actually know quite well! I don't know Roots at all, and I'm pretty knowledgeable on coffee shops I thought!! It was great to meet you Lynne, I will get my post done i promise. Is the Norfolk yarn shop the same as the one in Aylsham Road do you know ? Hi Gill - it was really lovely to meet you Gill, and Chris too. We should make arrangements for that meet-up in Holt soon! I love Norwich but haven't been for years. We're hoping for a few days in Norfolk this summer and looking forward to a trip into the city. Looked like you had a wonderful time Lynne and I love your photos, some fabulous works of art there.